The development of eastern Johor Baru as a premier marina destination will further spur Iskandar Malaysia's growth in offering high-end products in the local property market, says Johor's Chief Minister. Menteri Besar Datuk Abdul Ghani Othman said the Senibong Cove project in Permas Jaya is significant as it is believed to be the first full-fledged waterfront residential development in the state. The project features luxurious apartments, semi-detached houses, cluster homes, apartments, bungalows and terrace houses, with prices ranging from RM290,000 to RM1.8 million per unit. Senibong Cove, which is being developed by Australian property developer Walker Corp, involves an investment of RM1.7 billion and is touted to be the country's first property development by an Australian company. The housing project is modelled after Hope Island Resort on the Gold Coast where there is an international-standard integrated gold resort designed by Walker Corp. The Johor state government holds a stake in the project through its Kumpulan Prasarana Rakyat Johor (KPRJ), which together with Iskandar Waterfront Sdn Bhd, a subsidiary of Iskandar Investment Bhd, are landowners of the project. "Undoubtedly, it signifies a strong endorsement of confidence among foreign investors in the local property market," Abdul Ghani said in his speech at the project launch in Johor Baru yesterday. Abdul Ghani said that Senibong Cove, on which construction had started early last year, was testimony to the robust property market in Johor. "Demand for high-end quality properties is high and the purchasing power among consumers remains strong, as demonstrated by the high take-up rate of houses in Senibong Cove," he said. Walker Corp executive chairman Lang Walker said that most of the buyers of properties in Senibong Cove are Malaysian, with the rest Singaporean and from other countries. The first group of residents is expected to move in by early 2012. On another note, Walker said there might be other projects in Iskandar Malaysia to be undertaken by Walker Corp in the near future, judging from the level of confidence among investors. "This (Senibong Cove) is our first project in Iskandar Malaysia, but we are also looking into others here," he said. OSK Property Holdings Bhd plans to develop two condominium projects in Cyberjaya and Jalan Yap Kwan Seng in Kuala Lumpur. Executive director and chief operating officer Gerard Tan Boon Chuan said the projects are expected to be launched by year-end. The low-rise Cyberjaya project, with an estimated gross development value of RM300 million, will be built over 4.88 hectares (12.2 acres), near Perdana Lake. The Yap Kwan Seng high-rise condominium project is still awaiting approval. "We are now going through various designs and should be able to launch the Cyberjaya condominium project in the later part of the year," Tan told reporters after the company's annual general meeting here today. He also said OSK Property was optimistic about the local property market and had set its sights on launching a few projects this year. "We look forward to launching in May, Sutera Damansara's semi-detached houses. We had a soft launch last November and to date, 40 per cent of the houses have been sold," he said. The company also plans to launch its two-and-a-half storey semi-detached houses in Bangi by June as well as phase two of Mon't Jade, a low density upmarket bungalow development in Seremban. "The local property market outlook for 2010 is looking very positive and promising, with sentiment being given a boost through attractive interest rates, as well as a friendly purchasing environment. "Property prices in Malaysia are forecast to increase by five and 10 per cent this year in line with the economy," chairman Datuk Nik Mohamed Din Nik Yusoff said in the company's 2009 Annual Report. Agreeing with this, Tan said Malaysia's interest regime is still affordable although expected, to rise gradually. "Interest rates may increase. But this is expected as the economy picks up," he explained. 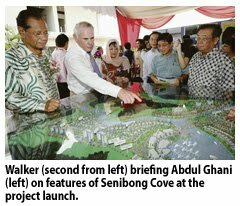 KUALA LUMPUR: Australia’s Walker Corp is investing RM1.7bil to develop Senibong Cove, Johor’s first exclusive waterfront enclave, on the eastern corridor of Iskandar Malaysia. The project will be developed in a joint venture with the landowner, Iskandar Waterfront Sdn Bhd, via Front Concept Sdn Bhd. In a statement yesterday, the JV company said Johor Menteri Besar Datuk Abdul Ghani Othman, was instrumental in securing the investment. Ghani said the project was the first of several initiatives to spread foreign investments in major Iskandar Malaysia growth areas. The new world-class residential enclave Senibong Cove is developed on 84ha freehold land overlooking the Straits of Johor. Chinese property prices rose at the fastest pace in nearly five years in March, official data showed Wednesday, amid growing fears of a bubble developing in the real estate market. Prices in 70 major cities rose 11.7 percent year-on-year in March, the National Bureau of Statistics said on its website, marking the biggest on-year increase for a single month since the survey was widened in July 2005. The statistics bureau had previously collected data on 35 major cities.That topped the 10.7 percent increase in residential and commercial property prices recorded in February and the 9.5 percent jump in January. Policymakers have pledged to step up efforts to rein in runaway prices amid growing complaints that apartment prices are out of reach for many people.